River Cottage HQ is one of those places that needs no special excuse to visit, and holding various events to allow for any budget, it is open to all who wish to taste its delights. Last Saturday night we were extremely privileged to be part of the sixty plus group of people to dine there in the Long Barn. Regular meals are held there, advertised on their website, and the ones with founder Hugh Fearnley Whittingstal present, sell out in a flash. Hugh wasn’t there on our night, but such is his reputation for running such a consistently high quality cookery school that many are happy to dine there safe in the knowledge that all of Hugh’s beliefs and passions with food rearing and cooking are carried through. We didn’t miss him! We arrived with our friends on a freezing but clear evening, early, by about half an hour. We knew that tractors and trailers would ferry us and other guests to the barn from the car park. We considered the walk down but the lights of the farm weren’t visible as encouragement for a steep trek in the dark. Soon taxis were arriving and depositing guests to the ‘Tractor stop’. The lights went on in the beautifully built wooden shelter and we spotted the new arrivals supping from steaming card cups. 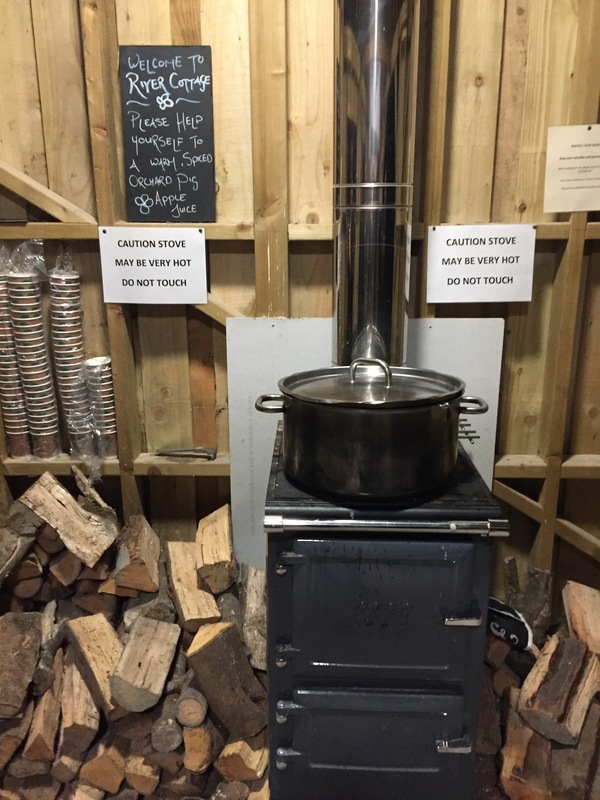 This tempted us out from the car and we were delighted to enter the shelter with its lit wood burning stove topped with a large pot of spiced warm apple juice. Self ladled tasty and warm juice, we enjoyed the welcome drink with the other guests as yet more taxis delivered them to the shelter. The first tractor and trailer arrived in time to make more space in the welcome shed. We were jiggled about on the rough terrain, the lady next to us had a bad back, and was suffering a little. As we approached the end of the track we could see the River cottage HQ all lit up, including the barns to the rear where we were due to eat. Some of the guests were booked for a private dinner in the actual farmhouse. We had a look in there before seating for dinner and made a note to ourselves that this would be an ideal location for a small dinner party to celebrate something special, or maybe just with people willing to share a special meal. We were escorted from the tractor behind the long barn and across a tiny bridge to a yurt. It was a very chilly night and so the log stove inside and sheepskin covered straw bales looked very welcoming. Having already been surprised with the warm apple juice, we weren’t expecting to be given a glass of Julian Temperely’s ‘Kingston black’ aperitif. Chrissy (still cheerful and working despite a nasty finger injury from setting up the tables earlier) welcomed us, talking about the drink and giving us a hint on what we were about to eat.As we sat around the fire, supping the delicious warming drink, canapé’s were served by a very friendly Steve,( Head of Front of house) including special nibbles for those with particular dietary requirements. After a couple of different canapés we were shown to the barn clearing the yurt ready for the next tractor load to be delivered. This was our chance for an explore. I’d been before but my husband and our friends hadn’t. Being great cooks and fans of Hughes they were so excited to see the REAL River cottage kitchen, complete with a chef preparing the private dinner. In the barn’s kitchens the chef and team were all very relaxed and friendly, despite a growing crowd of guests nosing about, looking in the kitchens and the large cookery school room. A bar was serving drinks in the long barn and a duet were playing. The barn was beautifully decorated, and thankfully warm! Once everyone had arrived and entered the barn, we were seated in our allocated places. Groups were seated together, but we were all sat next to at least one stranger! To my left were a couple of chaps from New Zealand who had won their tickets. Next to them were an Australian couple who had been given their tickets as a Christmas present. More delicious canapés were served, a beetroot dip and a creamed cauliflower humous ( or maybe the other way around!) Each couple were given a bottle of house white or red wine to share, a well stocked bar provided a good choice of local ciders, organic wines and soft drinks. A generous jug of water was also already on the tables for those like me who were driving or just don’t drink. Head chef Gelf Alderson talking us through what the evening had in store for us food wise. Details on where the meat came from, how it was slaughtered and how long it was hung. What marinades they’d used, how they had roasted pumpkin seeds with honey and chillis and what vegetables were still being harvested at River Cottage. Low food miles and high welfare are what Hugh and his team are all about, this dinner was a pure example of all their beliefs and experience put into practice. Parsnip soup with the tastiest pumpkin seeds ever! A very well hung shredded beef topped with a perfectly poached eggs and hollandaise sauce. The desert was the most incredible chocolate brownie with an ice cream, so good that none of ours hung around long enough to be photographed! The entire evening was accompanied by the constant hum of joyful guests talking and the music of ‘The Gravity drive’, the odd popular cover encouraging us to sing along! The first taxis were scheduled to be collecting guests from the car park at 10.30pm, and the coffee and petit for were only just served in time. Many of us were still eating and drinking well past 11.30 as the always friendly staff began to clear up around us. The tickets for the evening were bought through the website in advance at £90 per head. This included all the food, the aperitif, coffee or tea, warm apple juice in the car park and one bottle of wine per couple. It was perfectly possible to not spend a penny more than your ticket price if you could resist the cook books and River Cottage items on display! Eating out has only recently become part of our entertainment repertoire so I couldn’t say what a comparable meal out would cost. River cottage becomes more than ‘just a night out’, more of a life time experience, that you hope can become more often repeated and shared. I would highly recommend trying one of these evenings, you’ll enjoy perfectly cooked food, excellent service and some interesting fellow guests! Next Things that help me when bugs are going around!